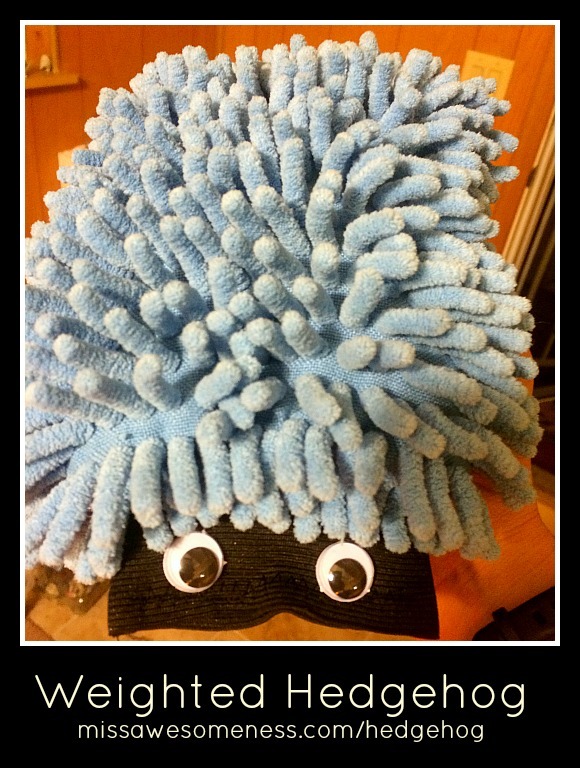 This weighted hedgehog is so simple to make. A sensory tool you can make extremely quickly and for less than $10. 1. Car-wash-mitten (often found in CVS $1-4 section or dollar store). 2. Eyeballs (If the sleeve isn’t black, you can Sharpie them). 3. Beans/rice/whatever weighted item you want, double-zipped in high-quality zip-lock. 1. Stick the ziplocked weighted material into the mitten. 3. Sew shut the mouth, or if you are sewing-challenged like me, I first used velcro until a friend helped me out. It only takes a minute or two. Have the hedgehog sit on their laps or by their side. Stroke the textured surface and feel the (mild) calming weight. I can see this being nice for a child who is resting and wanting to touch something. It’s a sensory tool, tactile with texture and proprioceptive with weight. You could probably also throw it as a form of ball with older children who can handle weight being thrown, to make it more sensory-motor! *It can be a choking hazard if taken apart, or potential suffocation hazard. Please supervise if used with younger children. 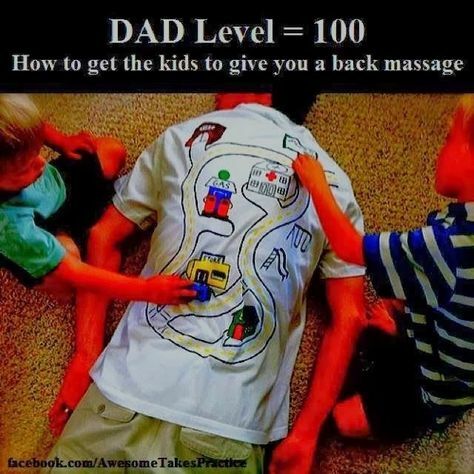 Found this silly picture with the dad wearing a road t-shirt and getting a “car massage” by his children. If you made a child some road pajamas (long-sleeved white shirt and pants and then drawn on with fabric Sharpies or the equivalent), you could do some great occupational therapy work. Because this does involve “on-body” play, remember to be extremely careful about liability and consider only using this activity when parent is present, so that you can role model how to play at home, and ensure child is comfortable and able to express preferences. TACTILE: Make the path long and straight down both arms and both legs – if a child doesn’t normally like to put on long sleeves/pants, maybe he would if the car otherwise has to come to a screeching halt so soon on the journey. BALANCE: Consider having the child stand up while the car drives! To make a creative pencil grip, take the ink part out of a pen, roll it into a polymer oven-bake clay and bake it, following directions you can find online for safety [using appropriate clay, not burning your house down or experiencing toxic fumes by baking it too long, etc]. Here’s a tutorial. Here’s another. Those tutorials show a more covered pen, but I think the grip is better off being wound around the pen like in my pictures below. At least the tutorials give you the basics. I haven’t tried it myself. Use your own judgment as to whether it’s a safe and appropriate activity and method. Place the legos closer to his body and make sure they are lower than his arms. He can stand up and push down on the Legos for more strength (thanks to the physics of levers – this is true for staplers and similar items as well). That way his entire body is being used for the interlocking of the bricks, compensating for his hand weakness. For the bigger pieces, if interlocking bricks are in correct position, just not fully pushed together, first move the item closer and lower as noted above, then use the flattened palm of hand to press them down firmly. The palm has more force/easier than the fingers. If a tower, it may need to be stabilized with the other hand to prevent tipping over. If there is empty space beneath part of a Lego due to the design, it can get difficult/frustrating to add onto that Lego area. Temporarily remove that part of the design so that it’s fully on the flat/stable surface. Add on the necessary extra pieces. Then place the entire part back where it belongs. PS: There are plenty of OT skills that can be worked on using Legos! Fine motor, visual motor, problem-solving, social skills…let me know if you want more information!